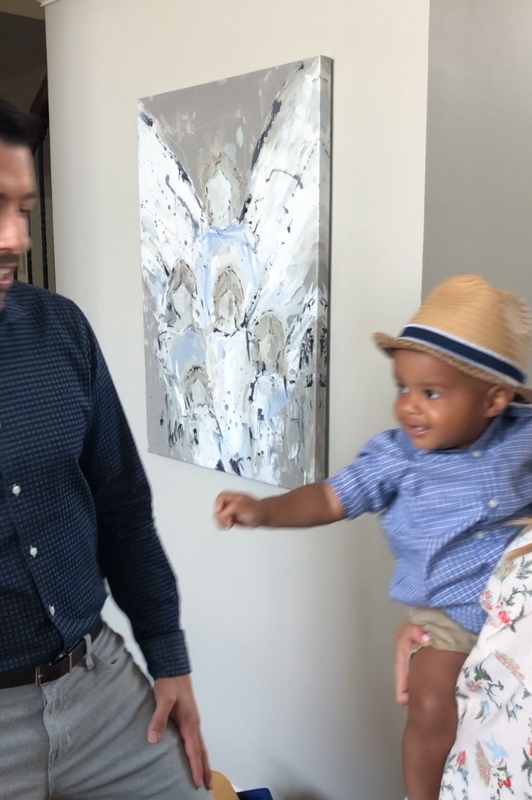 Our Property Brothers appeal is nothing fancy; it’s the functional, family friendly and budget conscious design in a home with seven children and two dogs. While I love the look of a traditional home with a slightly coastal or farmhouse feel, I fully expect everything in our home to be ruined. In creating the look and interior design of our home, I tend to rely on the methods, tips and tricks below to create stylish, calming and inviting spaces in a home of total mayhem! 1. Select a neutral color palette with pops of color. For the main design foundation of our home, I selected a light and airy color scheme that would give the illusion of larger spaces and more light. I prefer to use tones inspired by nature with hints of blues or greens in them. I love “greige,” the classic mix of gray and beige that can be mixed with both cool and warm toned paint and furniture. Sherwin Williams’ Worldly Gray is the color I have now used in three of my homes because I know that no matter what furniture or accent colors I use, it works with everything. Colonade Gray, Agreeable Gray and Sea Salt are other colors used throughout my home that work with just about anything. When my base is neutral, I can then interchange seasonal pillows, throws and décor without complicating the overall look and style of our home. One of my greatest design tricks is purchasing floor samples from places like Pottery Barn, PB Kids and Ballard Designs. At the end of every season, most stores switch out their displays and will sell off their floor samples. Ask the manager when that switch will occur and for his/her email to follow up. I buy a majority of my rugs, end tables and smaller pieces of furniture this way. Also, shop at places like Rooms to Go outlet centers where a piece of furniture may have a dent or imperfection and is discounted tremendously. One of my favorite dining room consoles came from an outlet center and only cost $200 because there was a huge scratch IN THE BACK! I also bought a queen sleeper sofa for $500 from a Rooms to Go outlet center and I couldn’t even find the defect in the cushion that was noted. 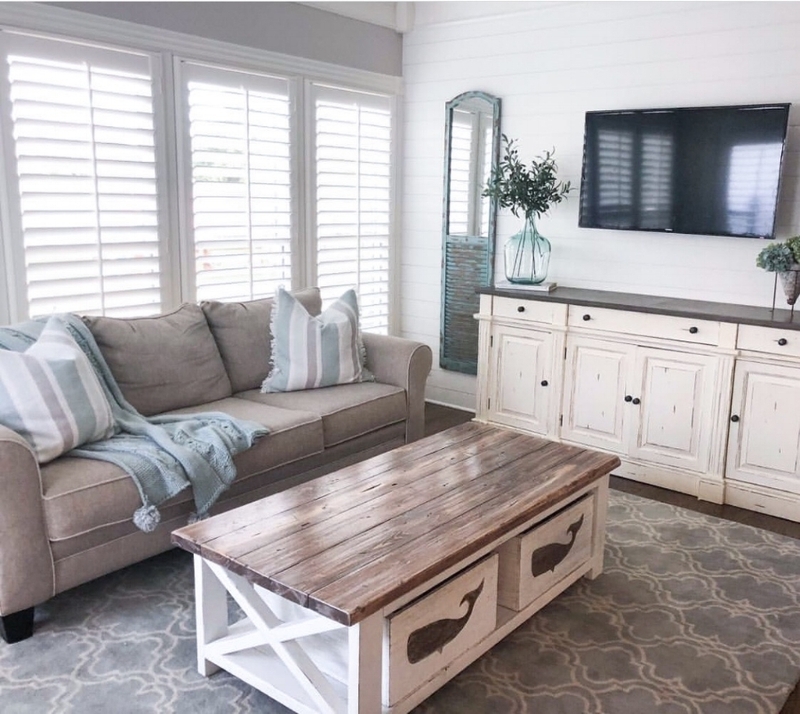 In the kitchen lounge below, I purchased the rug from a Pottery Barn floor sample, the couch from a Rooms to Go outlet center and had the custom coffee table made by Rustic Pine. Paint and a new light fixture can change the entire look of a room without a lot of expense. If you want to change the look of a room, start with a more impressive and updated light fixture. 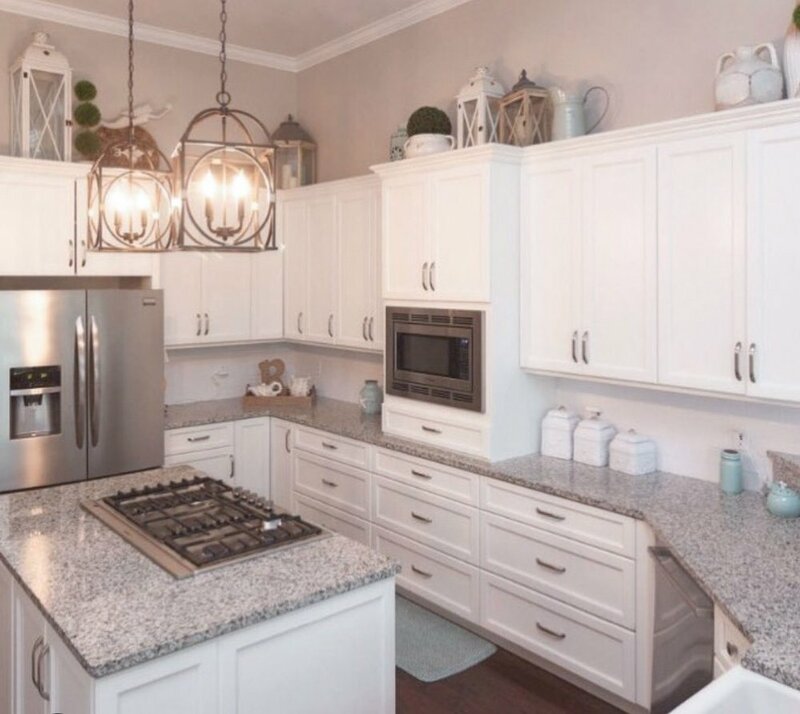 I did a lot of research in changing out the lighting of the Florida home we flipped and in our new Tennessee home so let me save you some time….. Amazon sells the exact same light fixtures for half the price of the same ones I saw in lighting stores. If you’re looking for a basic pendant, lantern, capiz (shell looking), beaded, kids chandelier or orb light fixture, PRIME IT! Click on each photo for the link. I have a closet in my home dedicated to throw pillows. That closet is now overflowing and pillows are slowly finding a new home in my teenage daughter’s spare closet. I trade out pillows and throws at the beginning of every season or holiday. It is the easiest, cheapest and fastest way to change the look of a room. On my larger couches, I have two to three pillows in each corner and on my chairs, I typically use two. I always use two neutrals and a pop of color. 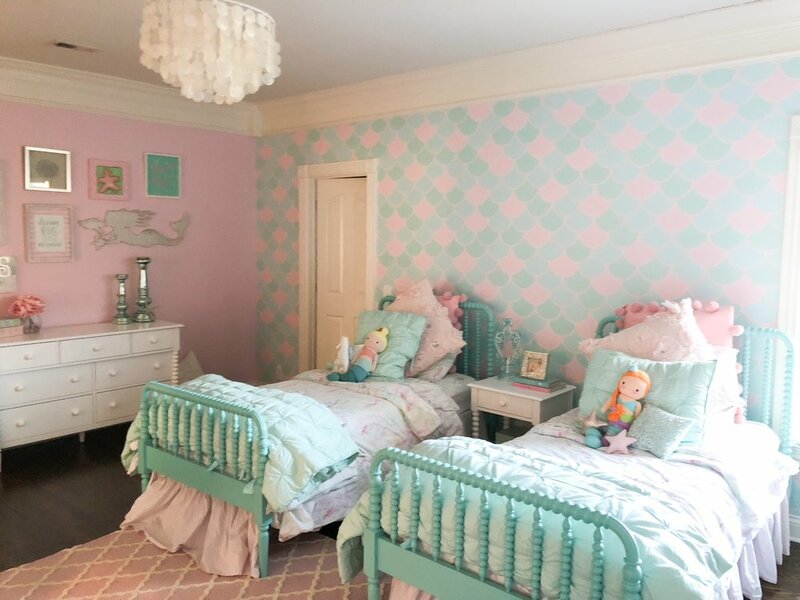 For the Property Brothers shoot, I used ivory and sea glass colored pillows accented with brighter navy. On the accent chairs next to those, I used the same colors just had one pillow with a stripe next to a solid. 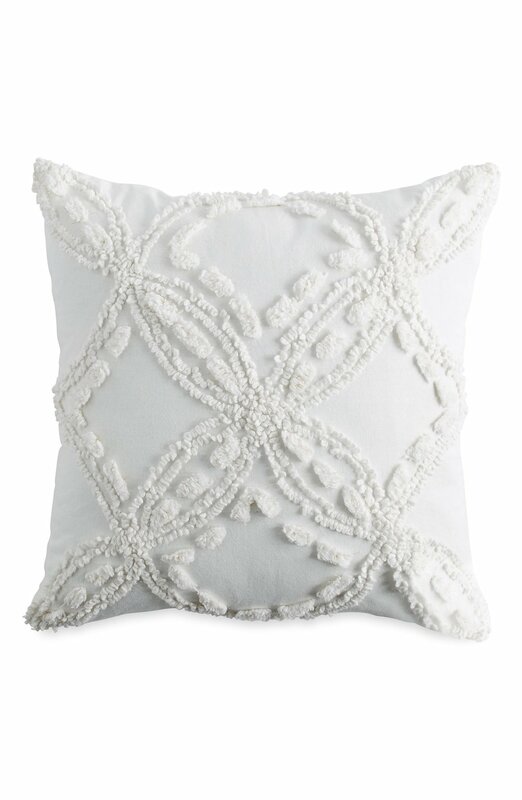 My go to pillow stores are Home Goods, TJ Maxx and Marshall’s..my favorite décor family. Most people know that these three stores are all owned by the same company so if you can only find three of four pillows at one store, chances are one of the others will have it. They also have great kids pillows and linens. I also LOVE Nordstrom for some of their more reasonably priced pillows. 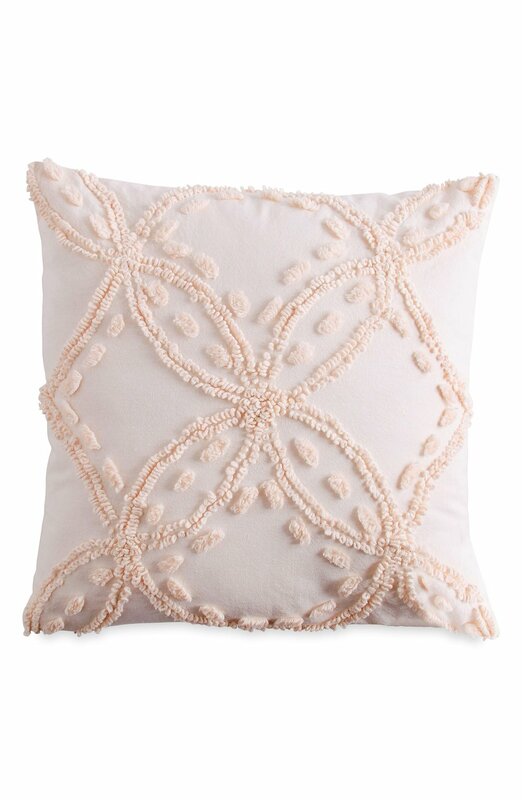 In fact, my "All Star" pillow is this Peri Home Chenille pillow that I have in multiple rooms in my home because it comes in ivory, gray and pink. I used it on couches and in bedrooms and it can be used in farmhouse, coastal, shabby chic or traditional homes. 5. Restyle your built-ins or family room shelves. This has always been the area I seem to struggle with the most. What do I put on my shelves? This tends to be the last area of my home to decorate so by the time I get to it, I’m just worn out. I know the trick of decorating in odd numbered groupings, like putting three items of various heights and textures near one statement piece of pottery but sometimes it helps to have a set of fresh eyes around. 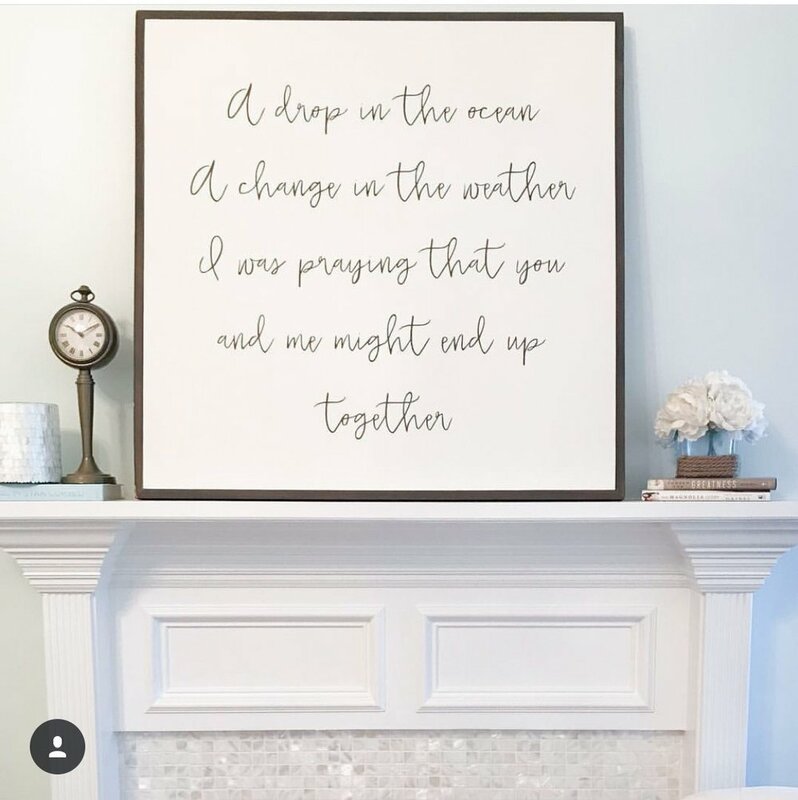 Two of my good friends, Julie and Mandy, with Over the Moon Interiors in Florida, have specifically helped me with this in our last three homes. (In Nashville, check out my two girlfriends, L&K Designs, who also can help with this.) The number one trick I have learned from them is to use old books to add texture, height and interest. Go to Goodwill, garage sales or antique stores (take the covers off the books) and use them under frames, candles and vases. Stack them horizontally or keep them upright between two decorative book ends …it’s a timeless look that adds simplicity and class. You also can't go wrong with the distressed white Corbel bookends seen in my photo below. I've seen these in so many boutiques but Amazon has the EXACT SAME ONES for the same price or less. These are great for bedrooms and bookcases. Here are the Amazon links for this entire look if you want an immediate fix for the every challenging shelf problem! 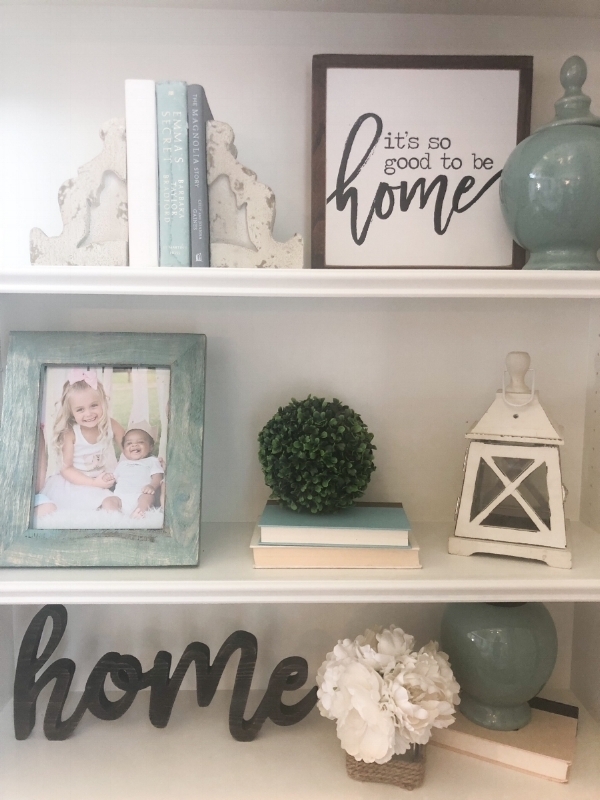 Click on the link for the "home' sign, a similar small, white wooden lantern, "Its so good to be home" sign, a similar spa blue-green ceramic vase (because I can't remember where I got these,) and the little 4" boxwood balls. I also don’t like to overload my shelves with any one thing. If your shelves are entirely composed of picture frames, maybe include something with greenery? My mother, the artist, always told me that you always want to mix textures. If you have something hard like a picture frame or vase, you need something soft next to it, like a small faux plant, to balance out the grouping. Above all, don’t overcrowd the space. Keep it simple. I never buy overly expensive rugs, ever. I have too many children and too many dogs to invest in anything that cannot be thrown out with minimal guilt. If I can’t find a floor sample rug at a store, I love Joss & Main, Wayfair and Boutique Rugs (shown below.) I’ll order four or five rugs online and for a fee of around $50, I can return them and have them picked back up on my doorstep. That return fee is well worth my time. 7. Sea glass is both coastal and farmhouse! I use a lot of sea glass and muted-color glass vases. You can find these in décor stores, antique shops and even Target! Magnolia has a great collection of muted greens and grays that I have on my current built ins. I also love Amazon for different shades of sea glass vases. I particularly love this little sea glass vase from Mud Pie for $22. “Lambs Ear,’ a faux, soft floral and olive stems go great in bottles and vases with narrow openings. White or colored hydrangeas are my go to fillers for pieces I want flowers in. 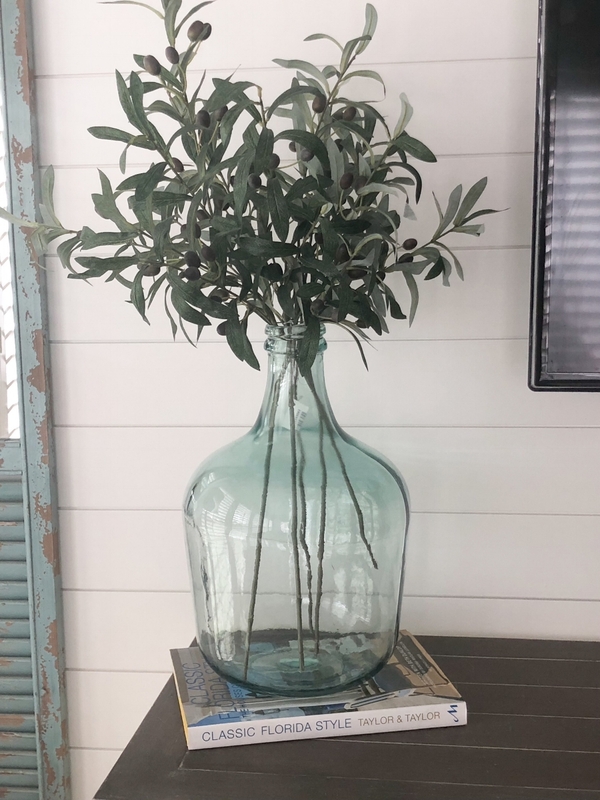 A simple and easy way to use sea glass is with the Faded Farmhouse vase below, with olive branch stems, on top of a coffee table book. One can never go wrong with a classic white or ivory dish set. They’re versatile, timeless and make a great base set for any seasonal table setting. I ALWAYS use this set when I decorate for company and accent the place setting with colorful bowls and napkins. Classic white dishes can be paired with vintage china or the latest trends in colors or patterns. White also looks polished and stylish in glass cabinets. These Pottery Barn "Emma" dishes are the exact set I have in my home. They are a Pottery Barn classic that seem to always be on sale. For the cheaper duplicate, check out these Better Home and Gardens Beaded dish set. When in doubt, add fresh flowers from the grocery store! One simple vase of flowers is always my default for dresser tops or tables…there’s nothing quite like a vase of fresh hydrangeas to brighten a space and add a touch of elegance. Publix has 3-packs of hydrangeas that are sold 3/$12 so I typically spend about $12 a week on fresh full hydrangeas and my home is happier for it. With so many children, I have become a master in repurposing spaces to become more functional areas for my family. Since our kitchen area was already large and could fit our 9 ft table, I turned the kitchen table nook into a "kitchen lounge" where my children can watch tv or play (photo above.) I used 1/4 of a large bonus room and turned that into a small bedroom and bathroom. An unused sitting room in our former Florida home became a nursery for my newly adopted son. I have never once used any sort of formal sitting area in any home so I felt a nursery within the master bedroom would be more useful for me. My babies always ended up in my room anyway so why not create an adjacent space to make infant care and night feedings easier for me? Although I love our new Tennessee home, I really miss this sweet little nursery. Paint color is Sherwin Williams Glimmer. 11. Use décor as STORAGE. With seven children, we have a lot of everything..specifically toys, blankets and shoes downstairs. I was sick of seeing my family room look like a preschool so I had two large, farmhouse storage boxes made for the main area of my home. (Laxamana Designs in the Nashville area built these.) Each box is nearly 3ft wide and 2ft tall. I use one box for toys and the other for blankets. I also have painted, wooden storage boxes under our coffee table for overflow toys. If you’re living room is cluttered with pink and blue plastic bins on racks, it may be time to hide your toys in something more stylish. I made up this décor term but it refers to any special piece of art, meaningful décor or design element that invokes some sort of personal connection and feeling. For example, I recently purchased a painting of an angel with four little girls under her wings. My husband and I have had five daughters, one of those being a stillborn little girl. I saw that painting and just began to cry in front of the artist, De Ann Designs, because it represented all five of the Reimold girls. I have this hanging prominently in a main area of our home because it just represents so much to me. Whether it is a blanket that has been passed down, your father’s favorite book or the lyrics of a sentimental song, make sure to include a few things that give your heart a hug.